Tibet has been on my list of must see places for about as long as I can remember having a list. Like many other places on this extensive list, I knew very little about Tibet before we began researching the trip. 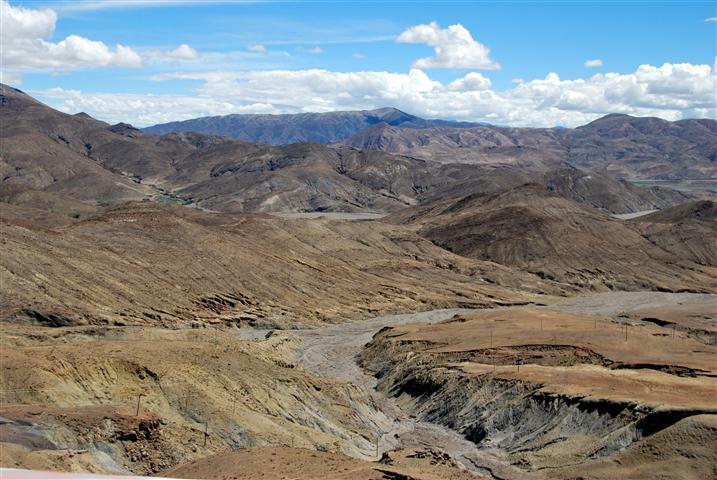 Once we looked into visiting, we quickly realized that access to the Tibetan Autonomous Region is tightly controlled by the Chinese government. 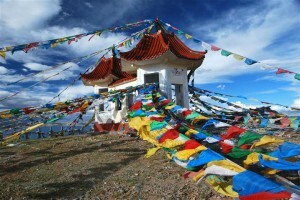 Visitors are not only required to obtain a Chinese visa but also a Tibetan Travel Permit. Complicating things more is that you must go through a travel agency in order to obtain the permit and agencies will only sell the permit as part of a package tour. Obtaining these official documents is just the first of many hurdles; foreigners in Tibet are prohibited from taking public transportation or visiting tourist sites without an authorized tour guide. Even with a guide, only sites specifically listed on the permit may be visited. 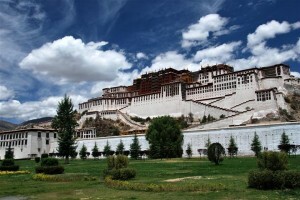 After realizing how difficult it is to get into Tibet, we considered removing it from our itinerary. After all, we typically prefer independent travel and visiting Tibet as part of a tour would make it the most expensive destination on our itinerary thus far. In the end, we figured this might be our only chance to gain a glimpse into Tibetan life and culture so we moved forward with planning our trip. In order to decrease the cost of the tour, we hooked up with Andri and Corina, a Swisss couple also traveling for a year. Over the course of numerous emails we arranged our tour and made plans to fly together from Chengdu in China to Lhasa in Tibet. Despite the government’s stringent requirements for visiting Tibet we had no trouble checking in for our flight to Lhasa. Our Tibetan Travel Permit was the key to getting on the plane. Driving from Lhasa’s airport to our hotel in the old town, there was very little indication that we were in Tibet. Chinese characters dominated everything from the street signs to the storefronts. Even more alarming was the abundance of Chinese military, something we hadn’t seen in other parts of China. The number of soldiers increased once we entered the old town. Perched on rooftops with guns and marching around the square in groups of six, there was no way to escape. It was tempting to snap photos but we had already been warned that photography was prohibited and spending time in a Chinese prison didn’t seem like the best way to make use of our limited time in Tibet. Although more Chinese than Tibetans currently live in Lhasa, Tibetan culture still lives on and there is no place where this is more evident than Jokhang Temple. Located just a short walk from our hotel, we witnessed countless Tibetan pilgrims completing a kora or circuit of the Temple each morning and in the late afternoon. Getting anywhere during these times was an exercise in patience as it is impossible to avoid getting sucked into the mass of people. Situated next to the Temple, Barkhor Square is a prime location for people watching. We watched as pilgrims dressed in brightly colored traditional clothing fingered prayer beads or carried prayer wheels which they continuously spun as they circumnavigated the Temple in a clockwise direction. Pilgirms not completing the circuit were prostrating and we could often hear the distant sound of wooden blocks hitting the stone pavement as they bowed and then stood, sometimes repeating this movement for hours. People watching inside Jokhang Temple was just as fascinating. The human traffic jam that started outside the Temple only seemed to increase as we entered the front gates. As our guide led us through the Temple’s interior explaning the meaning behind the intricately carved figures, we were surrounded on all sides by pilgrims waiting to pay their respects. Hands gripping 1 yuan bills and thermoses filled with liquid yak butter, they stood in a long line waiting to make offerings at the many altars. Judging from the number of people in line we predicted an entire visit may last a couple of hours and some pilgrims visit the temple every day. 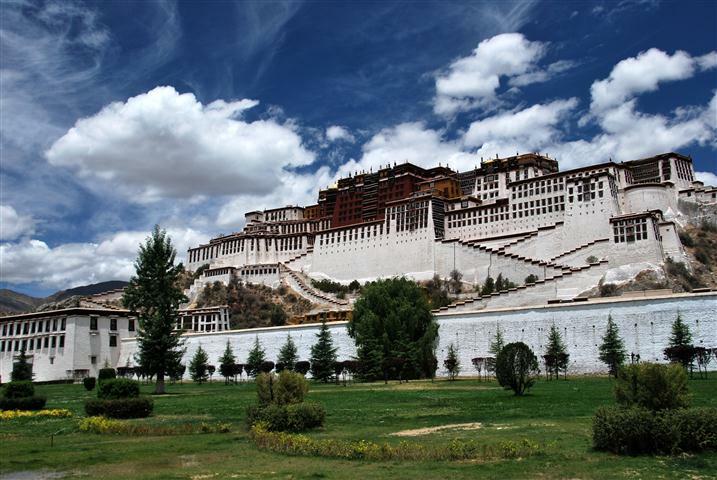 Any trip to Tibet would not be complete without a visit to Potala Palace, the former winter residence of the Dalai Lamas. This massive buildling is situated on top of a rocky hill and rises a further 13 stories against a mountain backdrop. The Palace dominates Lhasa’s skyline and is an impressive sight, even with the busy street and modern buildings in front. Potala Palace was the second official stop on our travel permit and we spent about an hour visiting just a small fraction of the one thousand plus rooms. 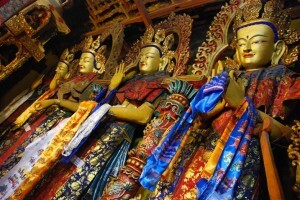 Walking a predefined route, we saw jeweled tombs of previous Dalai Lamas and countless statues of golden Buddhas and other deities. Many of the altars were covered in offerings of money and scarves provided by the seemingly endless stream of pilgrims that pass through the Palace’s rooms each day. After spending four days in Lhasa, we were fully acclimated to the high altitude and anxious for a break from temple and monastery visits. Eager to see some of Tibet’s natural beauty we set off on the Friendship Highway which connects Lhasa with Kathmandu in Nepal. We spent our first night at Namtso Lake, Tibet’s largest lake and one of the world’s highest salt lakes at 5000 meters above sea level. Although the altitude hadn’t affected us in Lhasa we felt out of breath while hiking around Namtso and also had difficulty sleeping at night. The lake is certainly beautiful with bright torqouise water surrounded by snow capped mountains, but there are many equally impressive lakes in the United States. 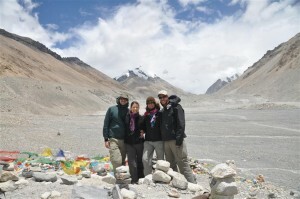 We spent one night at Namtso before returning to the Friendship Highway. Over the course of the next three days we visited Yamdrok Lake and monasteries in Shigatse and Gyantse. As with Jokhang and Potala we were impressed by the elaborately decorated interiors but we were particularly struck by the endless streams of devoted Tibeten pilgrims at each monastery. 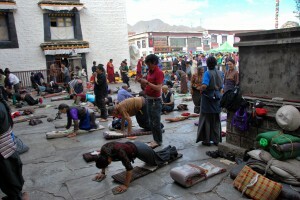 One of our most enjoyable mornings was when we decided to forego yet another monastery visit in Gyantse. Rather than give more money to the Chinese government by paying the monastery’s steep entrance fees we spent time wandering the city’s back streets and local market in search of a clearer picture of Tibetan life. 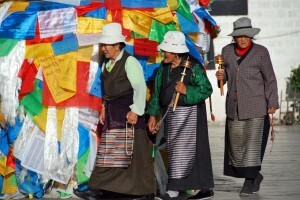 It was refreshing to see so many Tibetans dressed in traditional clothing and going about their daily business. However, we quickly realized that although the shops were filled with Tibetans, the vast majority of businesses were Chinese owned. Tibet’s economy has done very well in recent years but clearly the majority of people benefitting from this are Chinese immigrants. Our last stop before crossing the border into Nepal was Everest Base Camp. The morning of our departure for Base Camp, we woke early with high hopes of seeing the sun rise over the Himalayas. Unfortunately, clouds obscured most of the mountain range and continued to persist as we neared our destination. Hopeful the sky would clear, we ate lunch and familiarized ourselves with our home for the next 18 hours, a nomad tent a few kilometers from Base Camp. 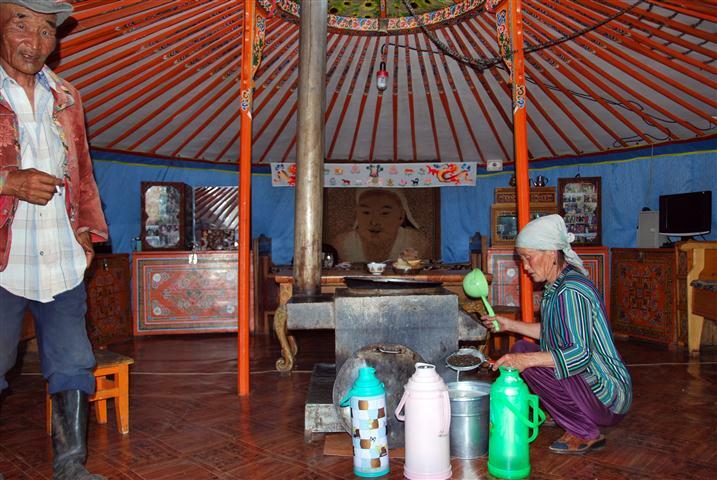 Reminiscent of some of the gers we stayed at in Mongolia, it was heated with yak dung stoves and was wam and inviting. After lunch, we chose to forego the overpriced bus that carries tourists to Base Camp and instead traversed the rocky terrain on foot. Other than a small group of soldiers, Everest Base Camp was completely deserted. During the May and June climbing season, the area would be abuzz with climbers but we visited in July and it lacked any of that energy. 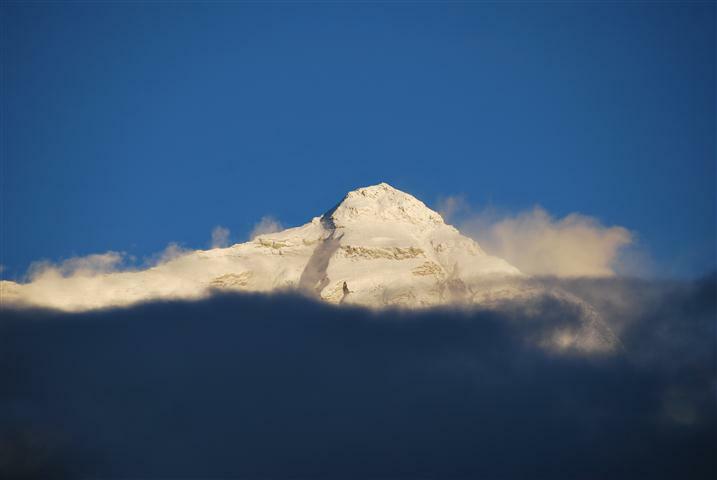 We spent nearly two hours at Base Camp, allowing the clouds enough time to part and reveal partial views of the mountain. Despite the uncooperative weather, the peak was certainly impressive. We enjoyed our time in Tibet and feel fortunate that we were able to visit a place where relatively few foreigners have been. Being exposed to Tibetan culture was interesting but even more fascinating was the tight control the Chinese government seems to impose on both foreigners and Tibetans. The military presence was especially alarming. Soldiers patrolled the streets of Lhasa, we crossed a ridiculous number of military checkpoints on the Friendship Highway and also passed several large military convoys. Our Tibetan journey ended with difficultly crossing into Nepal because the border town was not listed on our Tibetan Travel Permit. We spent four hours waiting outside immigration while the Defense Department filled out the necessary paperwork for us to leave the country! We’re glad we visited Tibet but considering the hassles and the overwhelming Chinese presence we’re unlikely to return and might not even recommend Tibet to other travelers. Thank you to Andri and Corina for putting so much time and effort into planning our Tibetan adventure! Of the many stops on our round-the-world trip, I was really looking forward to Mongolia. I pictured unending grasslands punctuated by only an occasional yurt. I thought of vast, blue skies and weathered Mongolian cowboys. Mongolia may have appealed to me because I thought it would be a little more like home. After two months in the heat, humidity, and occasional chaos of Southeast Asia I was looking forward to wide open spaces and the long summer days of my own latitude. We flew from Japan back to China, spending a few days in Beijing before catching another flight to Ulaanbaatar, Mongolia. We enjoyed our short time in Ulaanbaatar, but it certainly wasn’t the Mongolia I’d imagined. Ulaanbaatar has extravagant amenities like electricity, running water, permanent structures, and paved streets. 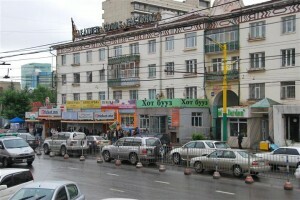 Ulaanbaatar is actually very cosmopolitan; many people were dressed much more fashionably than us. Interspersed among utilitarian Soviet-style apartment buildings are a department store, brewpubs, and a great variety of restaurants. Our first priority was to arrange a tour. We had only two weeks in Mongolia so independent travel wasn’t really an option due to a lack of public transportation and other infrastructure for tourists. 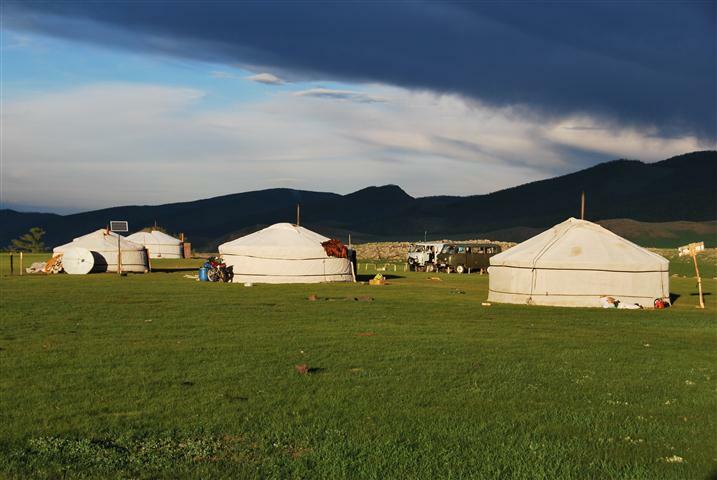 After checking with a handful of tour operators and guesthouses we found five other travelers interested in joining us for a 14 day trip through the Gobi Desert and Central Mongolia. With our tour settled our next task was to stock up on supplies. We expected warm days but also needed to be prepared for cold weather. We headed to Ulaanbaatar’s sprawling market and bought long underwear, hats, and sweaters. 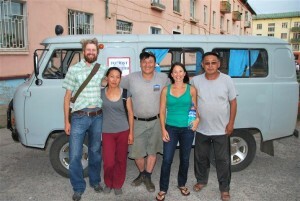 On the morning of our third day we piled into a four wheel drive Russian van and headed out of Ulaanbaatar. We were joined our guide, Baska, and driver Byra. Baska worked tirelessly throughout the trip. She rose before us and went to sleep after us. She prepared all of our meals, often crouched over a camp stove in the back of the van. Byra kept us entertained by joking that every woman he met, including Allison, was his girlfriend and about how his three little children would rush to greet him when he returned home so they could ask him for money. He managed all of this with an English vocabulary not exceeding fifty words. It was a pleasure to travel with both Baska and Byra, and Allison and Baska became particularly good friends as the only girls on the trip. We also enjoyed the company of our tour group. While I have neither the space nor the inclination to repeat many of their stories here, I will say that one of the more amusing nights involved several bottles of Mongolian vodka, the first match of the World Cup on a battery powered television, a goat, and a gushing head wound. We quickly fell into what would become our routine for the next two weeks. We drove hour after hour over rutted and bumpy roads, stopping for an occasional break and at midday for lunch. After several more hours of driving we would stop for the night. 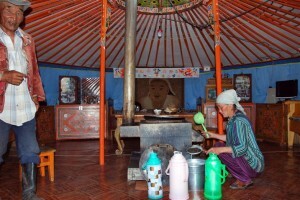 We stayed with nomadic families in gers, which are round, single room tents. There was furniture including beds, cabinets and shelves for cooking supplies around the perimeter of the ger, and a stove in the center. The wooden framework as well as the furniture was painted bright orange and then decorated with elaborate patterns of blue, green, purple, and gold. There was no running water but most families had a small solar panel to power an electric light. Our accommodation was typically a happy medium between shared quarters in a nomadic family’s ger and huge tourist camps with twenty or thirty gers arranged in neat rows. Most families had an extra ger for tourists. Every few days we’d roll into a dusty frontier-type town to buy food and supplies. Some of the towns had public baths where we could have a much appreciated shower and watch a torrent of sand and dirt go down the drain. The Mongolian landscape really did remind me of home. 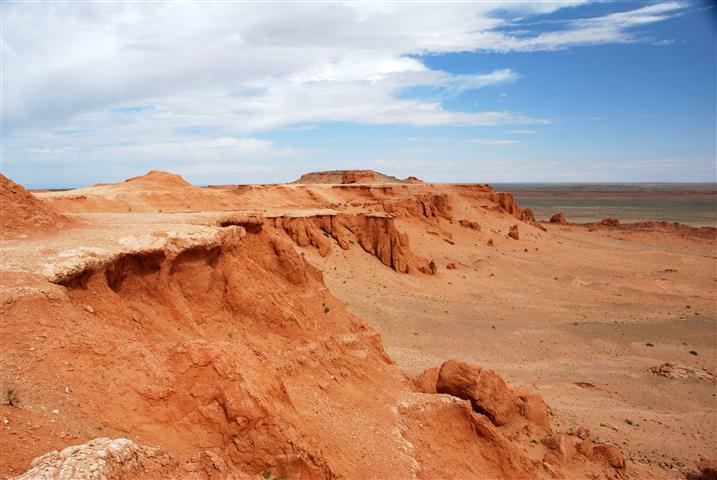 The Gobi Desert is reminiscent of the American southwest, although the sights at our national parks are grander and more awe inspiring. Central Mongolia’s grasslands and pine forests could have passed for Montana. The skies may have been most impressive; during daytime they were a beautiful deep blue and at night, with almost no light pollution, they were filled with countless bright stars. Our experiences with the Mongolian people were the most memorable part of the trip. Our group was split between two vans, and during the first afternoon we became somewhat concerned to find that Byra had lost sight of the first van and didn’t know the route. He steered to higher ground and craned his neck out the window but couldn’t find the van. After about a half hour we made our way to a small village where Byra asked for directions from a nomadic family. They invited us into their ger and offered generous portions of homemade yogurt and biscuits. We cautiously tried the food; I was a little wary of unrefrigerated dairy products, and realizing that the same hands that had just tossed another lump of dung into the fire had also kneaded the dough didn’t help either. On another occasion Byra careened off the road towards a ger after noticing that the nomads were milking their mares. Apparently fermented mare’s milk is a special treat in Mongolia, and he wasn’t going to miss the opportunity to sample some. I tried a few sips and would probably liken it to milk that’s been forgotten in the refrigerator during a long vacation, but without the chunks. Our most unique memory from Mongolia may have been our stay with Baska’s relatives. The family doesn’t normally host tourists so the experience felt more authentic than some of our other homestays, especially since we were able to participate in their newborn baby’s naming ceremony. During the ceremony the mother and grandmother washed the baby in three different types of baths while the father poured shot after shot of vodka. Neither of us typically do much drinking at 10:00 in the morning on a weekday, but Baska suggested that it would be rude to refuse. After they finished washing the baby, he was swaddled and passed to the father who whispered a name into the baby’s ear. After about an hour we staggered out of the ger into the blinding sunlight, feeling lucky to have been a part of this special event. Another highlight of our time in Mongolia was a small Naadam festival. Naadam is celebrated each summer in villages and towns throughout Mongolia and features competitions in traditional Mongolian sports: wrestling, archery, and horse racing. Midway through our tour we learned that a Naadam was planned for a nearby village, and we changed our route so we could attend. We reached the village and then continued driving into the desert for several kilometers, when suddenly a circle of vehicles appeared. In the center Mongolian men competed in wrestling matches wearing little more than a Speedo and shoulder vest. Prior to starting a match the two competitors would dance around the arena, slowly moving their arms like an eagle flaps its wings. When the match began the wrestlers circled each other, and would then often lock arms in a prolonged and unexciting stalemate, which ended when one finally gained the upper hand and threw the other to the rocky and unforgiving dirt. In Mongolian wrestling a competitor loses as soon as he touches the ground. Several times during the festival the crowd suddenly rushed away from the wrestling to catch the end of a horse race. 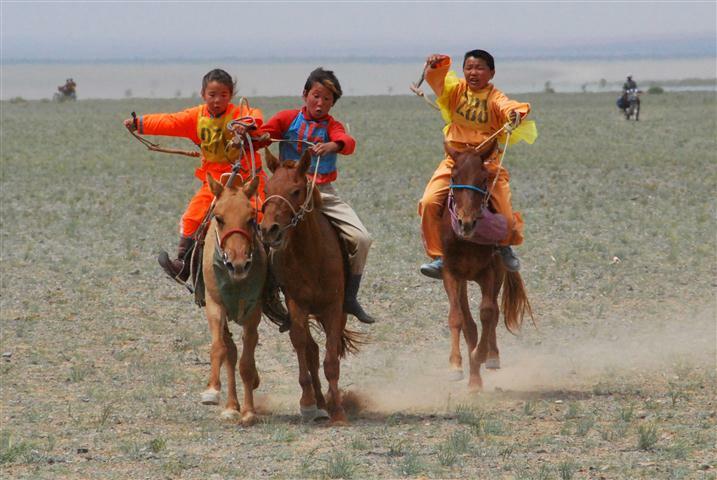 Unlike the short sprints of western horse racing, Mongolian races are cross country events. At this Naadam the jockeys walked their horses 15 or more kilometers to the starting line before barreling back to the festival grounds. It was never completely clear to me why they couldn’t just run a circular route. We also caught some of the archery, which seemed to be a rather subdued event. We saw just two competitors, one of which was a teenage boy being pretty much clobbered by an only slightly older girl. 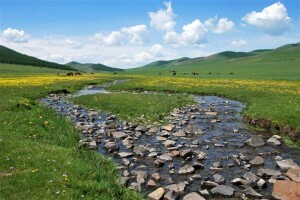 Mongolia exceeded our expectations, and our only regret is not having more time there. 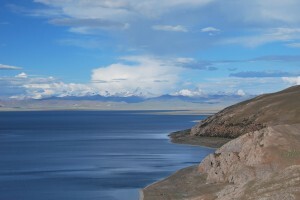 With an additional two weeks we could have seen Lake Khövsgöl and the forests of Northern Mongolia or visited the less touristed East or West. Although we were initially wary of traveling with a tour, in Mongolia the groups are small and there are plenty of opportunities for authentic cultural experiences. Even with so many countries left on our round-the-world itinerary, we’re certain that Mongolia will rank high on our list of favorite destinations.